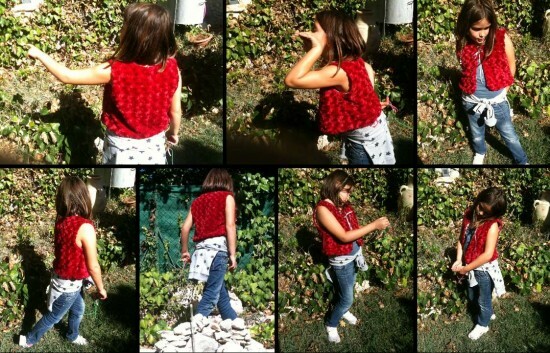 The shepherd vest from a free pattern ! But the real defining moment was when Petite Chérie saw this beautiful red fur. I told her that I was going to make myself a vest for a LARP costume. She then rubbed the red fur against her cheek (This fur is sooooo soft!) And looked at me with pleading eyes “I would like one too.” Haggard eyes of the mother wondering if she has enough fabric to make two vests, quick maths, sigh of relief, joyful scream of Petite Chérie. 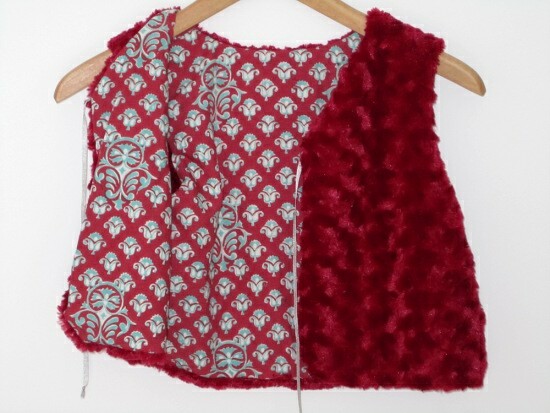 This shepherd vest was sewn from a C’est dimanche free pattern. “C’est dimanche” is a small French pattern company. If you want to use the pattern and need help with the French instructions you can use the French-English sewing dictionary and I’ll be happy to help too, just ask ! 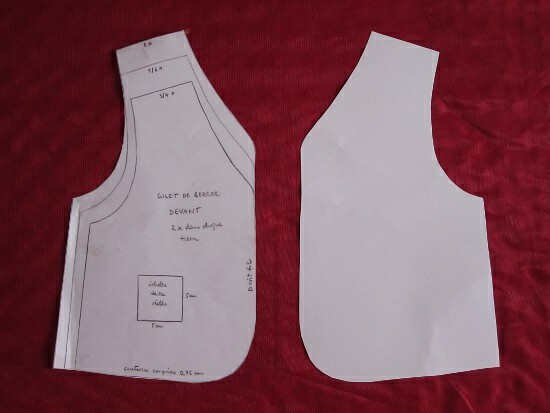 The pattern is for a Shepherd vest in faux fur or wool, fully lined (the vest can be completely reversible by the way), and it closes at the front with a little tie. To use the pattern you need to enlarge it (200%), check the size of the square drawn on the pattern. Seam allowance is included (0,75cm = 0,29 inches). The sizes available are : 3/4 years, 5/6 years et 8 years. This is a fast sewing project, I finished it entirely in less than an hour (cut not included). 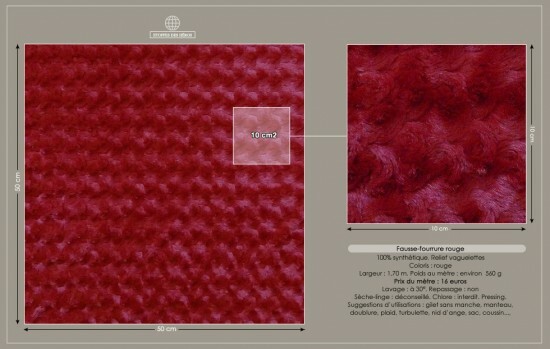 A 100% synthetic high quality, red fur. It’s extremely soft and was purchased from l’Etoffe des héros. The fur as a raised “ripple” pattern. 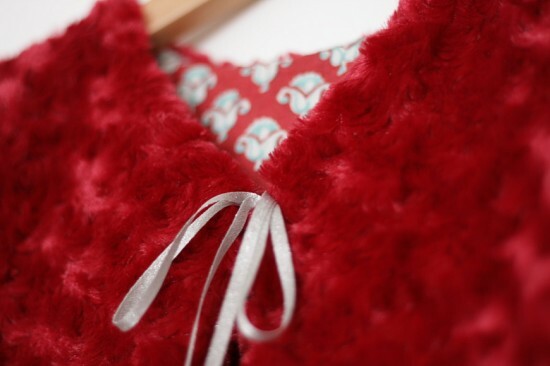 If you need guidance on how to sew fake fur, you can see this article, brilliantly called: Sewing faux-fur ! 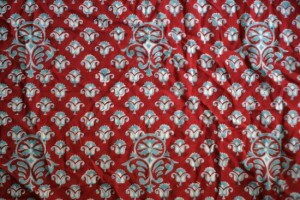 For the lining: a soft cotton hand printed and bought in India. For the tie she picked a silver ribbon. Now that the vest is finished, the cruel truth has revealed itself : it is enough ease for like 3 months! I feel this jacket will be offered to a friend’s daughter before spring because it won’t fit Petite Chérie anymore. Ah, the ephemerality of children’s clothing, it’s sad when they were sewn with love. Petite Chérie was not in the mood to pose for photos the day I took them… But I still managed to get some with the phone the next day. She loves the jacket so much that she even wore it on a sunny 26 °c (79°F) day … Note the sweatshirt around the waist but the fur vest over the tank top … No comment! My own vest in the same red fur is almost done, I just need to put in the hooks and eyes and hem it, but it will be for next week because I’m LARPing this weekend. 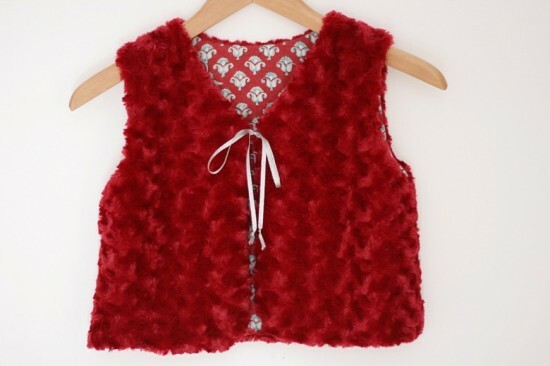 This entry was posted in Blog, Children Clothes, Sewing Projects and tagged Free patterns by Véro. Bookmark the permalink.